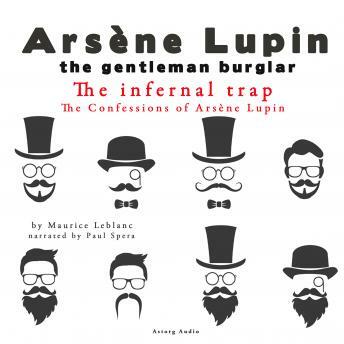 The Confessions of Arsène Lupin: ten grippling short stories in which the world's premier thief looks back on a lifetime of adventure and mysteries. He uses his wit and courage to outsmart criminals, pull wool over the eyes of the French police, and solve terrifying mysteries, always keeping just enough time to save a pretty lady and pocket something for himself. Intelligent, witty, funny: there is the real gentleman thief in all his brilliance! The Infernal Trap is the fourth story out of ten. The next are: the Red Silk Scarf, Shadowed by Death, A tragedy in the forest of Morgues, Lupin's marriage, the Invisible Prisoner, and Edith Swan-Neck.